After this success, the couple left for Manchester where they played the Theatre Royal. I went to University in Manchester and our son, Louise's great, great, great nephew is there now; our daughters live and work there but until now, none of us have ever known that Louise performed at one of the most historical venues in this great city. It sends a shiver down my spine to think that I have walked past that building in Peter Street so many times without knowing its connection to me. 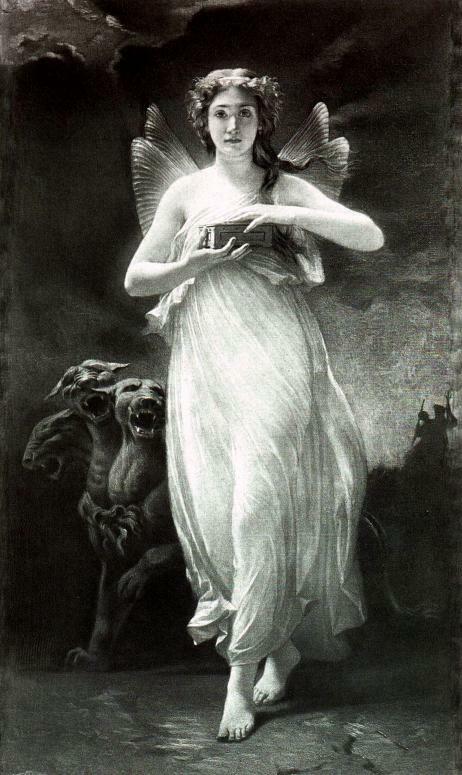 This is a representation of Psyche painted sometime in the late 1840s by Paul Alfred de Curzon - exactly at the time she was being portrayed by Louise in Dublin. In 1848, Louise and John also added a daughter, Kathleen, to their family but, even though she had become a new mother, Louise did not stop acting; by 1849, they were in Belfast, where they were engaged at The Royal Hibernian Theatre. After the season at Belfast, they then moved to the Theatre Royal, Glasgow and settled there for a while, living at 10, Stockwell Place, St. Enoch's. This is the old Theatre Royal that was built on Dunlop Street and survived at least two major fires, including one in 1849, just prior to the arrival of the young family, that killed 70 people. Stockwell Place was right next to the theatre and evidently provided convenient lodgings for working across the road. In the 1851 Census for Scotland Louise's profession is that of actress, John is listed as a comedian and little Alfred aged 6, is earning his keep as a tumbler otherwise known as an acrobat! The Theatre Royal Glasgow, Dunlop Street. Several sources state that acrobats were extremely popular in 19th Century theatres and many were child acts so I believe it is likely that Alfred probably earned a good income. All the time Louise was working with her own family, the Bullens were still touring in England, mainly around the east and south-east and in 1851, her father died at Warminster leaving Catherine and Louise's brothers and sisters by themselves and Catherine's journey to Auchtermuchty began. One of the reasons she chose to go north may well have had something to do with her eldest daughter and her husband's former partner both now working in Scotland. Later in 1851, John is named as working at the Theatre Royal Dundee and the this is where the birth of their third son, Henry John Bruce is announced in the Baptismal Register for Perth on 22nd September with the christening on 12th October. Henry John is announced as the lawful son of John Bruce, comedian of the Theatre Royal Dundee and Louise Bullen, his spouse. In February of 1852, according to 'The Era,' business seems to have picked up with the company now playing to 'full houses.' The drama of 'Rob Roy,' describes Louise as Frances, rendering the duets 'exquisitely,' with her part of Claudine in 'The Miller and His Men' eliciting bursts of applause from the 'delighted' audience. In April 1852, her benefit is announced including a performance of 'Peter Bell the Waggoner,' 'How to Settle Accounts with Your Laundress!' and 'Hunting a Turtle!' There then follows a wordy explanation as Mr. Mortimer apologises to theatre patrons for the non appearance of Mr. Powrie earlier that week who had evidently got his wires crossed and gone to Edinburgh instead! The absence of the star attraction does not augur well for Louise's big night. Reading through various newspaper accounts and reviews, it can be seen that the Bruces started working with James Mortimer in 1851 when he takes a company to Montrose and then on to Dundee. By 1853 though, he is making his first appearance in Edinburgh and it is virtually certain that John, Louise and the children have moved on. How far they moved on, especially John proved quite a surprise. The Bullen family settled in Auchtermuchty in the early 1850s and after a short while, Catherine began putting on shows and plays in halls in the area. On occasion Louise is mentioned as singing or acting with her mother and he rest of her family usually to very good reviews. There is a bit of a mystery in 1854 however when Louise and John have left Scotland and are appearing at the London Palace of varieties with a company that includes a Mr. Hare. I thought it interesting that one of Louise's sisters Catherine Eliza, generally known as Eliza, had a son whose last name was Hare though her eventual husband's name was Spikins but I shall revisit them later. It does not appear that John and Louise stayed very long in London for in January 1857, Louise is acting in South Shields with Mr. Benson's company with John nowhere to be seen until mention is made of John Bruce in The Era in January 1858, not in South Shields but in New York where he is appearing in an American play. This is the last time I can find any record of John. I presume he went to America and died either there or shortly after he returned home, though I can find no record of his burial. The next time I encountered Louise was in a marriage register for the first period of 1859 when she was married, aged 34 for the second time.